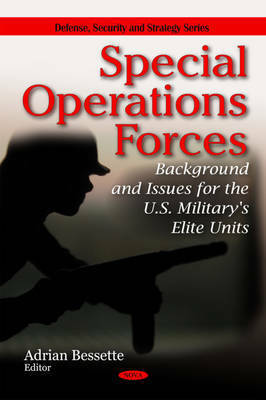 This book looks at the Special Operations Forces (SOF), which are small, elite military units with special training and equipment that can infiltrate into hostile territory through land, sea, or air to conduct a variety of operations, many of them classified. SOF personnel undergo rigorous selection and lengthy specialised training. The U.S. Special Operations Command (USSOCOM)oversees the training, doctrine, and equipping of all U.S. SOF units. USSOCOM has about 54,000 Active Duty, National Guard and Reserve personnel from all four Services and Department of Defense (DOD) civilians assigned to its headquarters, its four components, and one sub-unified command. Special Operations Forces (SOF) also play a significant role in U.S. military operations and the Administration has given U.S. SOF greater responsibility for planning and conducting world-wide counter-terrorism operations. The merits of cross-border raids and possible equipment and logistical support shortfalls, which are potential policy issues for congressional consideration, are examined in this book as well. This book consists of public documents which have been located, gathered, combined, reformatted, and enhanced with a subject index, selectively edited and bound to provide easy access.